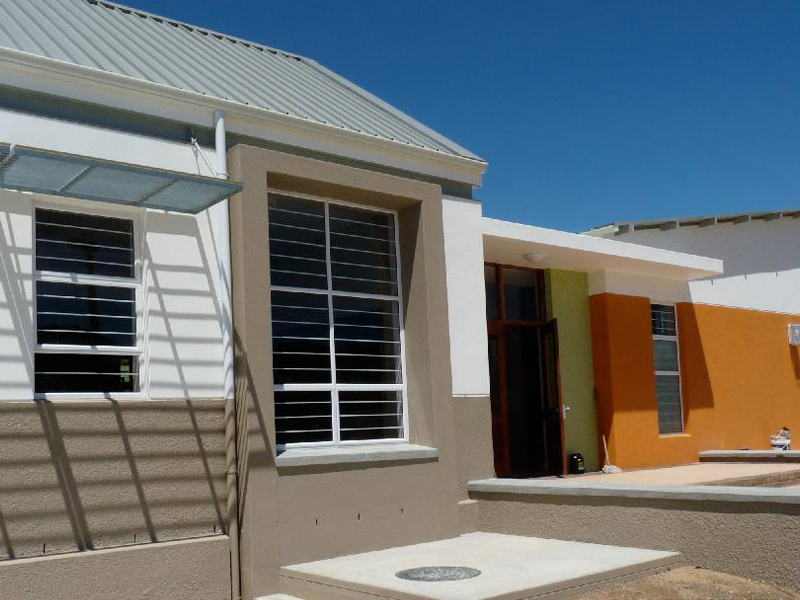 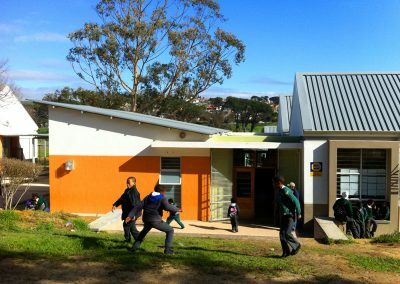 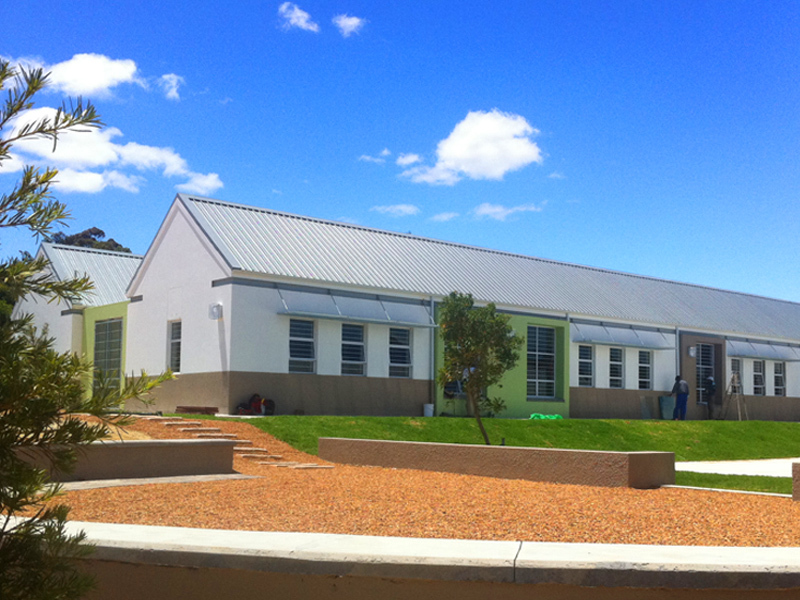 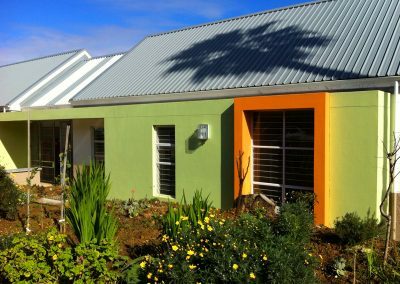 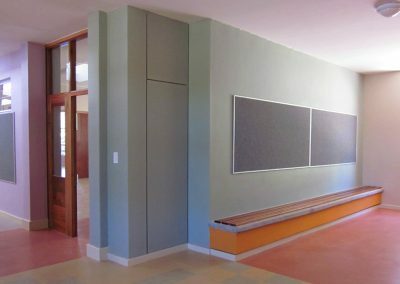 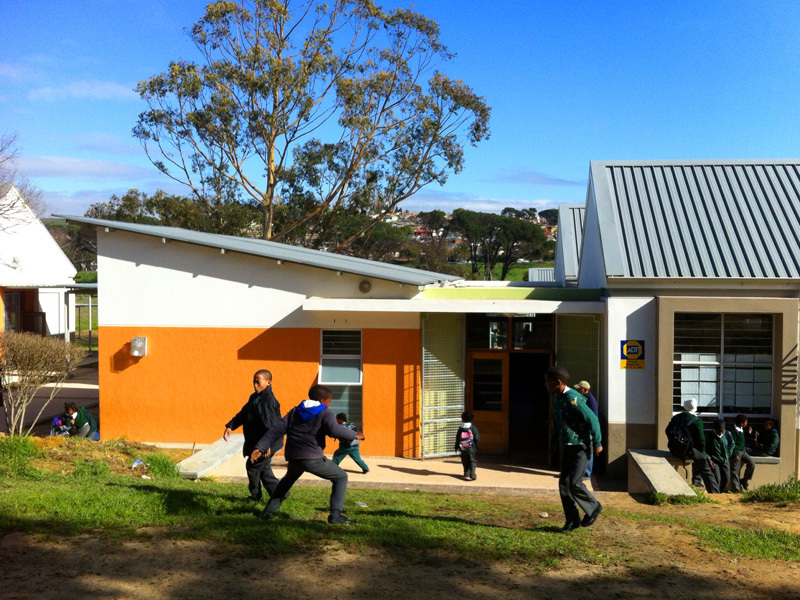 Cloetesville Primary School is situated on the outskirts of Stellenbosch in the suburb of Cloetesville. 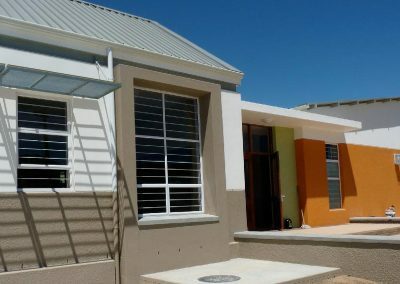 The site is on a west facing slope in a shallow valley that is visible from the R304, a busy road that connects Stellenbosch to the N1 highway. 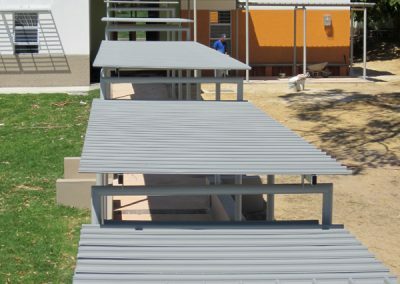 The existing school consisted of long, prefabricated buildings in a poor condition with no clear visual connection from the school administration building to the classrooms. 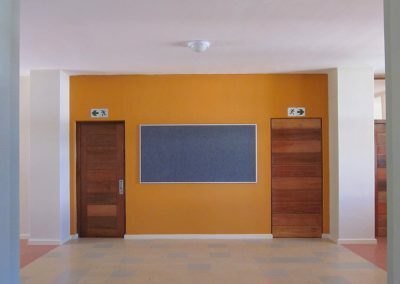 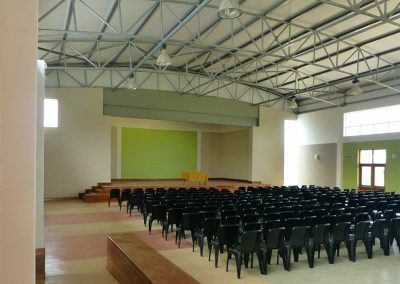 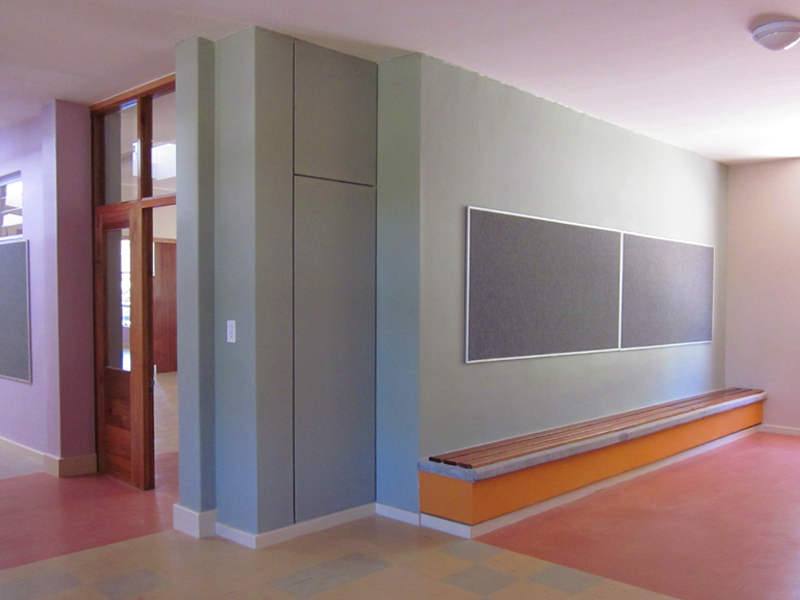 To allow the old school to operate during the construction of the new, we phased the construction process, starting with the completion of the classroom blocks. 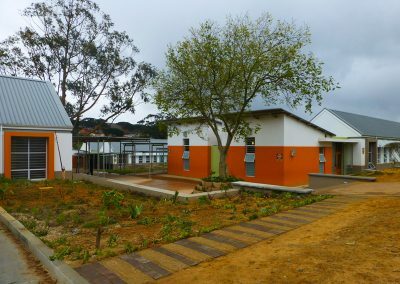 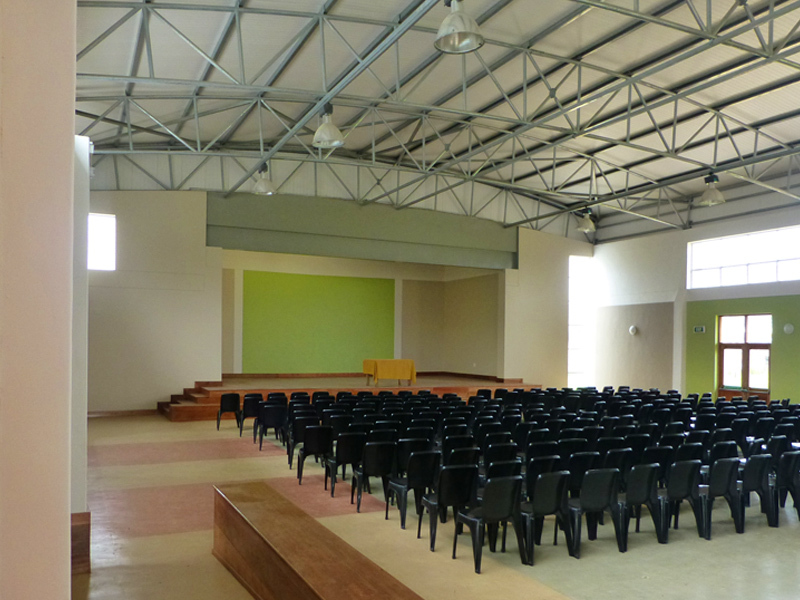 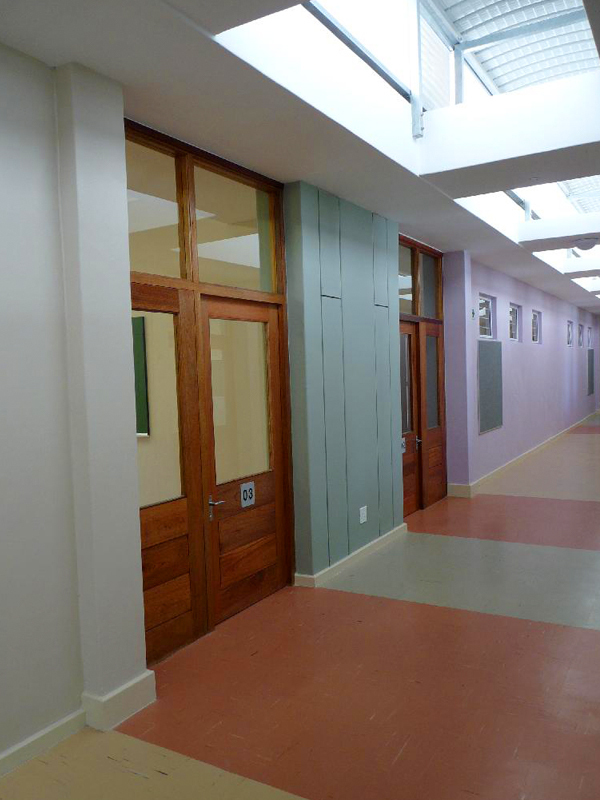 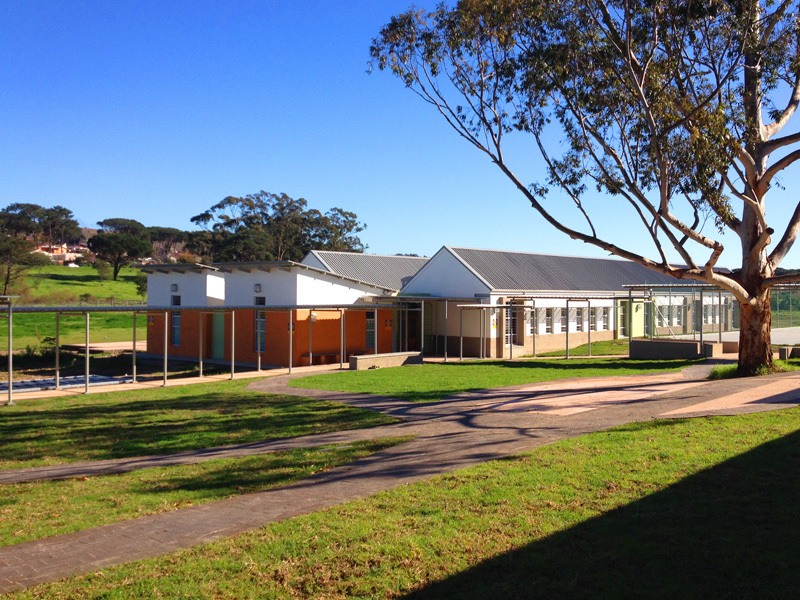 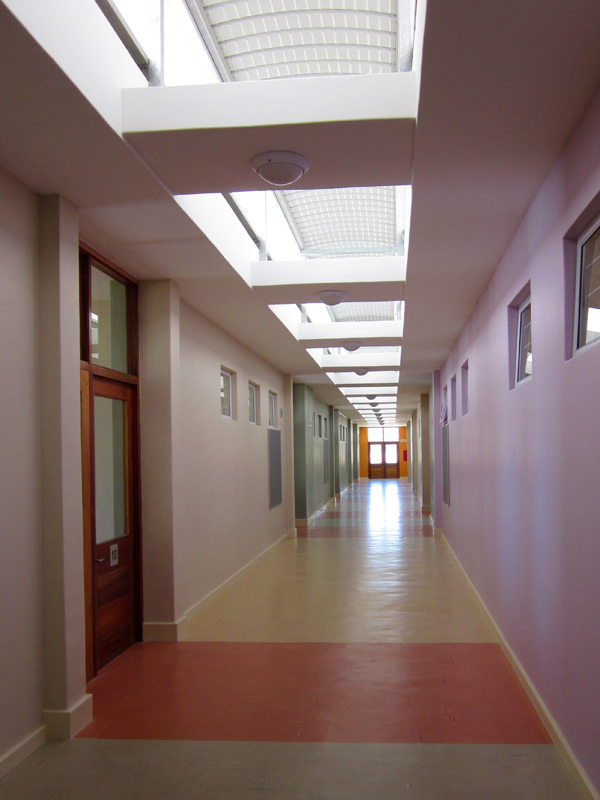 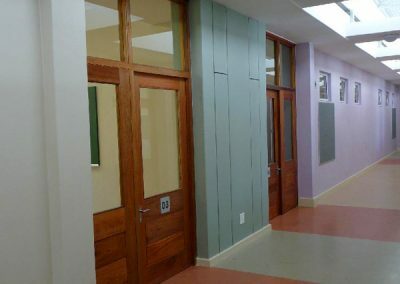 In phase two these were occupied by the learners allowing most of the existing prefabricated buildings to be removed and the remainder of the new buildings to be constructed. 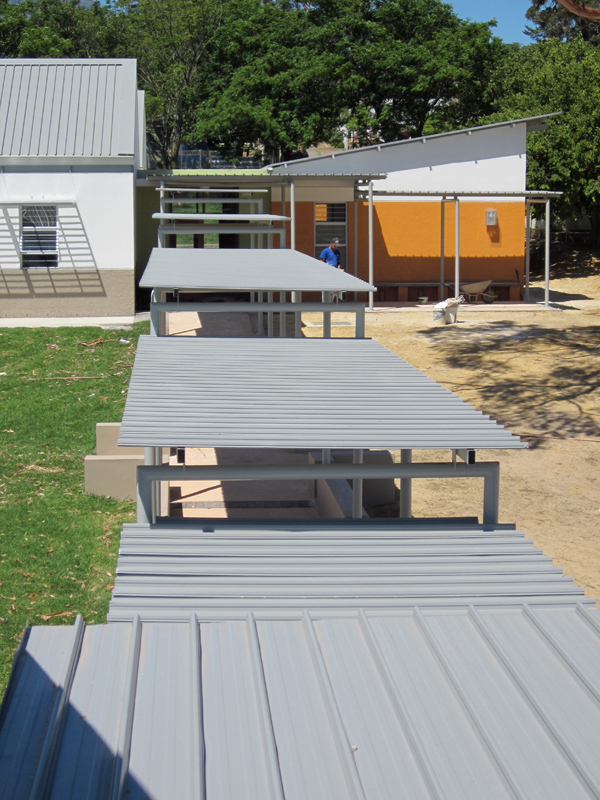 In phase 3 the last prefabricated building was removed and the pedestrian access and parking areas completed. 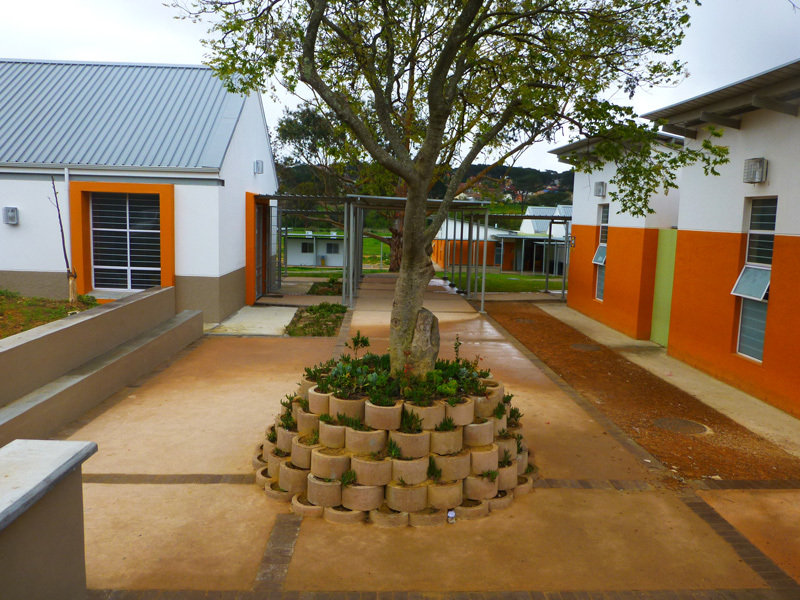 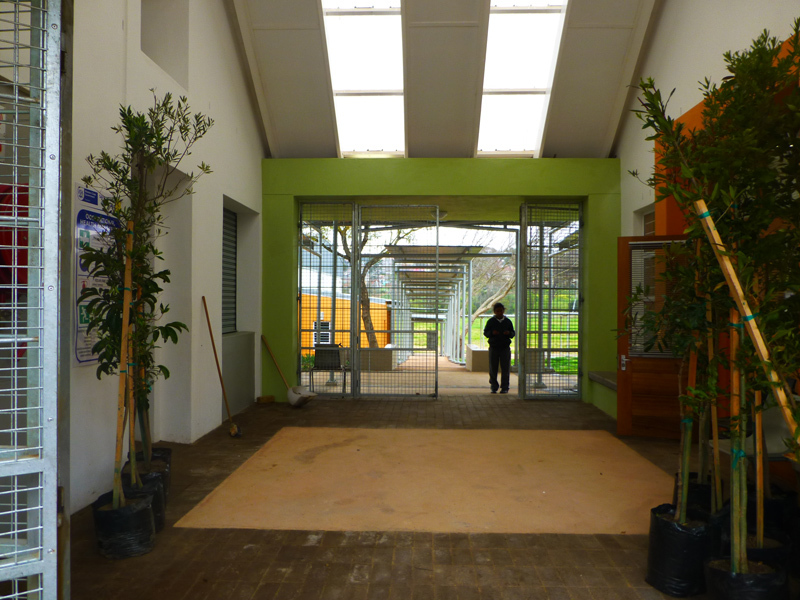 The existing school grounds contained many full grown trees and these were used as defining elements in the design of the new school. 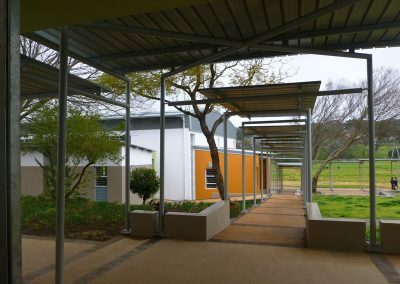 The new buildings are carefully placed between existing trees and positioned to create differing sized usable outside spaces. These outside spaces are either grassed, paved or accommodate ball sport courts. 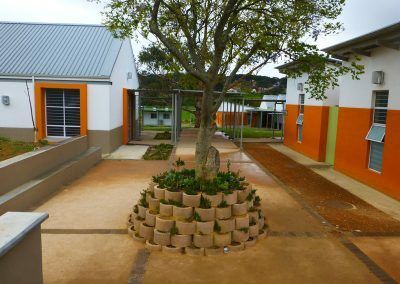 The careful consideration of the existing established trees contributes immensely to the country feel of the completed school. A central courtyard layout with covered walkway edges links the various building groups together. 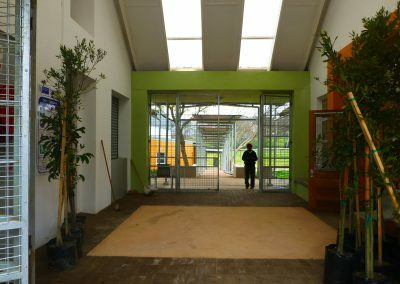 We chose to divide the accommodation components into separate spread out buildings, as one would see on a farm, rather than one large building as Stellenbosch is an area of wine farms with barn and shed buildings. We created barn like buildings reminiscent of the traditional cape dutch farmsteads of the area and gave them a contemporary interpretation using white as the predominant colour with an earth coloured plinth and fun bright coloured highlighted areas as focal points. 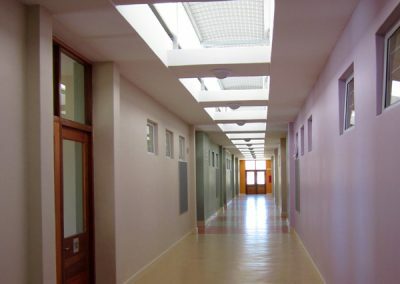 Flat roofed wide passages flooded with light from skylights give access to the classrooms allowing them to be lit from two sides. 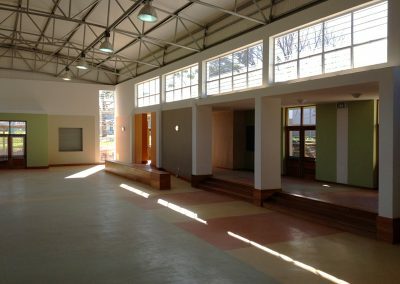 The spaces are light filled, airy and fun to learn in, whilst the outside spaces allow the children to run and play games and also sit on built in benches and learn outdoors when the weather is good.